Do kids’ behaviors leave you confused and frustrated? Dayna Abraham is teaching the world there’s a better way. She, too, was baffled by her son’s behaviors until she realized the power of using science and child development to see him for the superkid he already was. In this revolutionary book, Dayna bridges the gap between kids and the adults who love them by empowering kids to be their own problem solvers and helping adults understand what kids really need to succeed. As a teacher, writer and mother, she explains that undesirable behaviors are really a cry for help. Kids have a need, but lack the tools and skills to express it. In this book, she gives kids fun projects and tools that boost their ability to control their behaviors, explain how they’re feeling and gain confidence. 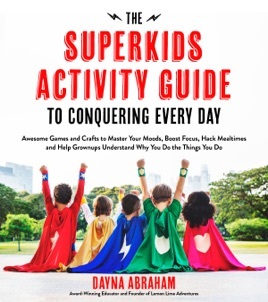 The Superkids Activity Guide to Conquering Every Day puts the power into kids’ hands to understand themselves, discover their superpowers and have an awesome day, every day.